It's no secret that author Kate Morton is one of my favourite Australian authors. Her novel The Forgotten Garden (5 stars) is one of my Top 20 favourite novels and I also enjoyed reading The Distant Hours (5 stars) and The Shifting Fog (4 stars). 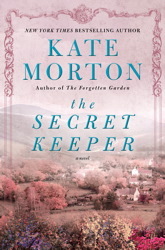 Well, I'm very excited about Kate Morton's latest book The Secret Keeper, due to be published later in the year. Until now, the cover designs for The Secret Keeper have been a well kept secret, but they've just been released so I thought I'd share them on My Four Bucks. Which cover design do you like the most? I prefer the green and blue design best, but that's just me. I can't wait to read The Secret Keeper when it's published in October 2012. Will you be adding it to you your TBR pile too? On Facebook we have two comments, one: I love the pink :-) and another: I vote green :) so it's still pretty even. I know, I can't wait either, sooooo excited!